What does your dog have in common with a mushroom? Both need protection against viruses, bacteria, molds and parasites. And that’s obviously really important. What’s amazing about mushrooms is that they can protect themselves against these things. What’s even better? They can provide the dog that eats them with that same defense! If you’ve ever wondered about the benefits of mushrooms for dogs, you’re going to want to keep reading. Medicinal mushrooms can provide your dog with nutrients that are superior to those provided by most plants, making them true superfoods. Mushrooms are fungi – specifically, cap fungi. Fungi are genetically closer to animals than plants, and in the classification of living things, fungi are a separate kingdom. They have cell walls like plants, but the walls contain chitin, like insects. Chitin is a white, horny substance found in the outer skeleton of insects and crustaceans and in the internal structures of other invertebrates. Chitin is also what gives mushrooms their meaty texture. Like animals, fungi absorb nutrients from plant or animal matter around them, and they cannot photosynthesize as plants do. The amino acid content of mushrooms is comparable to that of animal proteins, and they contain all the main classes of lipids. Mushrooms are the only non-animal based food that contains vitamin D and they also contain considerable amounts of vitamins B, C and E.
Medicinal mushrooms can provide your dog with nutrients that are superior to those provided by most plants, making them true superfoods. This is why most traditional medicine systems include fungi. Mushroom nutrients are protected by the chitinous wall, so their nutrients are released only upon warming. But it’s important to note that most mushrooms contain monomethyl hydrazine, a compound found in jet fuel. It is highly carcinogenic, but inactivated by cooking. This shouldn’t stop you from using mushrooms however, because they’re packed with immune regulating properties. Just be sure you cook them first, for both you and your dog. What does immune modulation mean? It’s kind of like immune balancing. Studies show that constituents in mushrooms can make natural killer cells, T cells, and macrophages more effective. These patrol the body for viruses, bacteria and cancer cells. Mushrooms can increase levels of other normal physiological mechanisms that boost immune function as well. These natural body compounds are complement 3, interleukin and interferon. They’re all part of your dog’s natural defense against viruses. You will commonly see glucans listed as ingredients in immune modulating supplements. And now you’ll know that they come from mushrooms. Immune modulation via medicinal mushrooms for dogs can help with the destruction and clearance of viruses, bacteria, harmful fungi, parasites and cancer cells. It can also help push the reset button on allergies and autoimmune disease. Using mushrooms for medicinal purposes is not a new idea. Ancient cultures have hunted, cultivated and harvested mushrooms for thousands of years to promote wellness and to treat disease. Modern science has long recognized the efficacy of fungi too. Penicillin was derived from mold and many current pharmaceuticals are derivatives of mushrooms. The fungus and plant kingdoms have a beautiful way of balancing their own internal effects, and when a constituent is isolated, extreme effects are more likely to occur. Although there are thousands of mushroom species, only about 25 are routinely used for human and now pet consumption. Most are cap fungi and gilled mushrooms of the phylum (taxonomic subdivision) Basidiomycota. Mushrooms don’t kill cancer; they help your pet’s body fight cancer. In studies, extracts of reishi containing beta D-glucan were effective in stimulating T cells to release cytokines, which have been proven to fight tumor cells. Lentinan is an immune modulator from Lentinula edodes that triggers Tumor Necrosis Factor and Natural Killer Cells. This is a real substance and a cell type found in the body that can kill cancer. Other nutritional benefits of mushrooms include their effectiveness as antioxidants for free radical scavenging. Free radicals are produced as a result of cellular metabolism. Too many free radicals lead to aging, arthritis and cancer. Synthetic antioxidants are suspected to be carcinogenic, so researchers are seeking natural antioxidants and finding them in mushrooms such as reishi and turkey tail. Through the power of chemical reduction, these mushroom extracts can donate hydrogen atoms to break the free radical chain. The regular button cap mushroom has high glucan content, which makes them great at donating hydrogen atoms, which is the job of an antioxidant. Prebiotics feed probiotics, which are the good bacteria in your dog’s gut. Good bacteria prevent diarrhea and constipation, produce B vitamins and support the immune system. There are three to four pounds of germy ecosystem in the gastrointestinal tract and this system needs feeding. High fiber mushrooms are perfect for the task: mushroom terpenoids are antimicrobial against pathogenic bacteria, and not against beneficial bacteria. A 2013 study by the Institute of Food Technologists found that the polysaccharides from the stem of shiitake and other mushrooms can enhance the survival rate of Lactobacillus acidophilus, Lactobacillus casei, and Bifidobacterium longum during refrigeration. The mushroom constituents also had protective effects on these probiotics in simulated gastric and bile juice conditions. These results showed that mushroom wastes, which are cheaper than other sources, could be an important new alternative source of prebiotics. From the phylum Ascomycota, cordyceps is the famous caterpillar fungus, worthy of special discussion. This fungus attaches its stalked fruiting body to a caterpillar larva. Harvesters collect the fungi and larvae and sell them as a unit. The preservation of this symbiotic relationship may be crucial to the efficacy of the product. Use care when selecting a supplement: some products examined by the FDA contained only rice flour. Not all supplement makers are reputable. Cordyceps contains important constituents such as polysaccharides, vitamins B, E and K, amino acids and fatty acids. It can help with lowering cholesterol, protecting the liver and kidneys, anti-cancer, antioxidant, anti-asthma and for balancing blood sugar. Cordyceps extract has been shown to reduce tumor size and prolong survival time in mice with lymphoma. 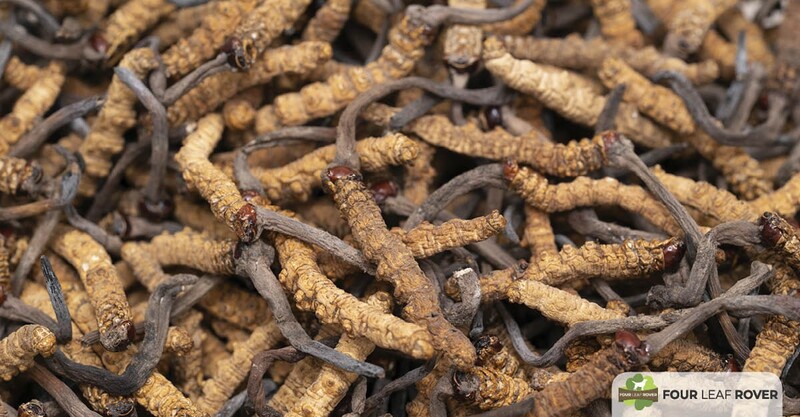 In TCM, cordyceps is a kidney tonic. Studies have shown beneficial effects against nephrotoxins, which can damage kidneys. Cordyceps also increase corticosteroid production and protecte the kidneys in studies where it was used with cyclosporine to prevent tissue rejection. A cordyceps powder inhibited antigen-induced eosinophils in rats and a cultured extract improved respiratory symptoms in 75 to 85 percent of participants with severe disease in two clinical studies. Eosinophils are a type of white blood cell that increases in the blood in response to allergens. Mushrooms have amazing potential as functional food medicines and it is easy to see why they can push the reset button on allergies and autoimmune disease. I use these major mushrooms in every cancer treatment protocol for my canine patients. However, even holistic veterinarians have barely scratched the surface of the potential for these miraculous mushrooms for dogs to prevent and treat disease. Your dog deserves Four Leaf Rover's REAL mushrooms ... grown the way nature intended and complete with all their health-boosting properties. My 13.5 year old Lab is a 2 time cancer survivor. We've used several mushroom supplements over the past 3 years, but most were much more expensive per serving and required more product per dose. 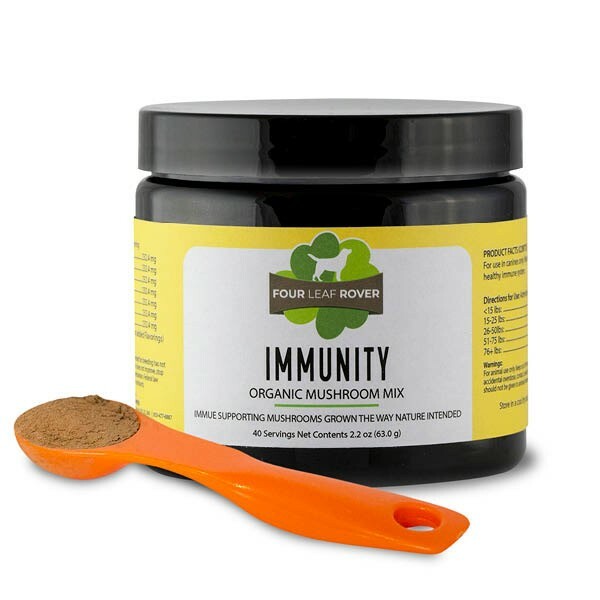 The Immunity Medicinal Mushroom Blend is reasonably priced and Adi loves the taste. It will continue to be part of our daily supplements to keep her going strong. My 12 year Maltese has gotten a new lease on life. She is having better movements and a lot less issues with her digestion. Perky puppy again. I am so happy to find this product. Medicinal mushrooms are hard to find way up here in northern BY (near Canada). You can't beat the convenience.